National University of Medical Sciences also known as (NUMS) was established back in 2015 through parliament act. It was established as a Federal Public Sector University. Chancellor seat is held by honorable PM of Pakistan and COAS is Pro Chancellor. Main purpose of establishing National University of Medical Sciences also known as (NUMS) was to lift up the standards of study and service in advance health sector. Another main part on which they focus and invest a lot is Research and Development (R&D). 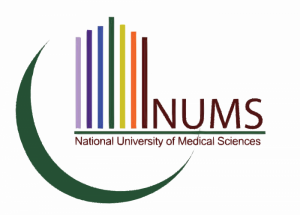 National University of Medical Sciences also known as (NUMS) runs their operations from Rawalpindi Pakistan and they are recognized from Higher Education Council of Pakistan (HEC) for awarding degree, they are working under administration of Pakistan Army Medical Corps. You can get update about their test on Pakprep.com (To start your preparation today CLICK HERE). And can also prepare yourself for test from Pakprep.com. We have more than 15000+ solved MCQ’s along with explanation. After that you can examine your performance in analytics and evaluate where you stand. registration you can apply online or download form online and pay for it in mentioned banks, most probably it’s going to be HBL. 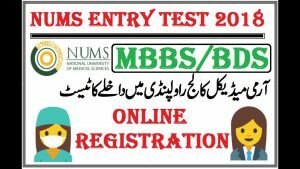 This entry was posted in NUMS and tagged ABOUT NUMS, AFFILIATED INSTITUTIONS, answers key for NUMS, CMH Bahawalpur, CMH Lahore, CMH Multan, Entry Test, entry test preparation, HITEC Taxila, How to prepare for NUMS admission test, KIMS CMH, MBBS admission, MBBS Admission Test, NTS NUMS, NTS NUMS Admission, NTS NUMS Test Answer Key 2017, NUMS 2018, NUMS Admission, NUMS Admission form, NUMS Admission test, NUMS BDS, NUMS Biology MCQs, NUMS MBBS, NUMS MOCK test, NUMS Registration, NUMS REGISTRATION 2018-19 SESSION, NUMS registration date, Quetta Institute of Medical Sciences, WAH Medical Collage on September 27, 2018 by Pakprep.com Admin. Sir,i got 949/1050 marks in matric and 988/1100 in fsc and 135/180 in nums test and sir i am from army brat.sir is this any chance of my admission in nums, in amc and in fmdc? sir i got 1050/1100 in matric 988/1100 in fsc and 125/180 in nums any chance?? in fmdc or AJK reciprocal seats..
my marks in matric1029/1100 and in fsc 973/1100..nums entry test marks 144..can I get admission in AMC or fmdc?I have punjab domicile. I got 1057/1100 in matric , 1006/1100 in fsc and 146/180 in nums test. Can I get admission in AMC or FMDC? My aggregate is 86.38% . Any chance for fmdc from Punjab domicile? Kindly reply ! my aggregate is 86.74%. is there any chance for fmdc or amc admission? i have punjab domicile.